We’re so glad you decided to sign up as a member of the Hudson Players Club. Remember, all you need is a desire to develop theatre in our community, but be sure to tell us below if you have special skills that might help us out. Fill in the form, and choose a User Name and Password. You will receive an email and we will get in touch with you to arrange your payment. Once you’re paid up, you will get access to the Members’ Newsletter, and all the benefits of membership in HPC. Our members are the lifeblood of the Club. You don’t need to be an actor, you just need to love theatre. The more members we have, the stronger our voice in the community. So join us today! Volunteer! We always need people to work with us as ushers, stagehands, event organizers and publicity mavens. Do you enjoy what we do, then get in touch with Lily Sargent and even if you’re not sure about being a member, start off as a volunteer for an upcoming event. Sponsorships! Local artists, business owners, service providers, you all make Hudson a vibrant an exciting place to perform in. 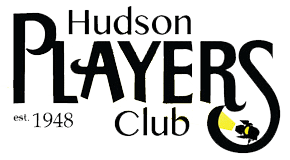 Hudson Players Club gathers audiences from a wide area and getting involved in one of our events as a show sponsor, or even as our featured Season Sponsor offers exciting opportunities to promote your brand and your community spirit. As a Sponsor or program advertiser, your message will reach the local community as well as members of the surrounding area that come to enjoy our performances and events. As we are a local community based organization and function mainly by our wonderful volunteers, supporters and donations, we thank you in advance for becoming part of our organization and supporting us in any way you can. Fill out the form on the right and press the send button. You will receive a confirmation message that it has been sent. Then if you want to pay for your membership online just use the PayPal Button below – choose your membership category. You will receive a personal confirmation from the club when you have been registered and payment received. Please become a member today..